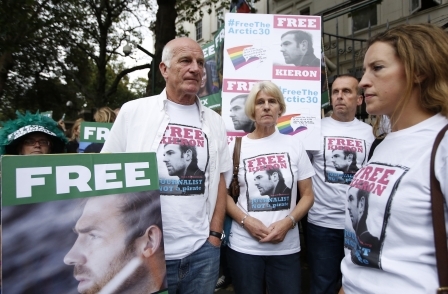 Russia has dropped piracy charges against British journalist Kieron Bryan and 29 Greenpeace activists instead reclassifying them as “hooligans”. The move sees the maximum prison term faced by Bryan reduce from 15 to seven years. Bryan was recording a Greenpeace protest aboard their vessel, the Arctic Sunrise when it was stormed by Russian security forces on 19 September. Greenpeace was protesting against attempts to drill for oil and gas in the Arctic Circle. All 30 people aboard the ship have been jailed pending a further court hearing next month, although it is hoped this move by the Russian investigators will lead to the complete dismissal of all charges. Vladimir Chuprov of Greenpeace Russia dismissed the reduction in charges and instead called for the immediate release of all those detained. He said: “The Arctic 30 are no more hooligans than they were pirates. This is still a wildly disproportionate charge that carries up to seven years in jail. It represents nothing less than an assault on the very principle of peaceful protest. Those brave men and women went to the Arctic armed with nothing more than a desire to shine a light on a reckless business. They should be with their families, not in a prison in Murmansk. “We will contest the trumped up charge of hooliganism as strongly as we contested the piracy allegations. They are both fantasy charges that bear no relation to reality. The Arctic 30 protested peacefully against Gazprom's dangerous oil drilling and should be free.